According to the FTC, the number one consumer complaint in 2010 was Identity Theft . 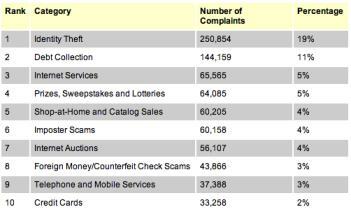 The Federal Trade Commission recently released their list of top consumer complaints from 2010 and identity theft is by far the number one complaint, even though the gap between 1st and 2nd has closed since 2009. In 2010, ID theft complaints represented 19% of the FTC’s complaints with debt collection clocking in at 11%. The gap between the two has narrowed from 2009 when ID theft represented 21% and debt collection represented only 9%. The increase in debt collection complaints is validated by the fact that roughly 12,000 FDCPA (Fair Debt Collection Practices Act) lawsuits were filed in 2010, a record number that we’re on pace to match in 2011. The number of credit bureau complaints went from 31,629 in 2009 to 28,724 and the number of credit repair complaints went from 41,448 to 31,726. The FTC continues to lump credit repair with advance fee loan scores despite the two having nothing to do with each other. Credit card complaints are down from 45,203 in 2009 to 33,258 in 2010. This seems to confirm that the CARD Act has had some success in curbing the more abusive credit card practices, such as retroactive rate increases. John Ulzheimer is the President of Consumer Education for SmartCredit.com, Credit Contributor for Mint.com and the author of the book “ You’re Nothing But A Number .” He is an expert on credit reporting, credit scoring and identity theft. Formerly of FICO, Equifax and Credit.com, John is the only recognized credit expert who actually comes from the credit industry.